This post will be a response to Michael Pucci’s thorough and thoughtful account of the plot, themes and merits of ‘O City of Broken Dreams’ at the Mookse and Gripes site earlier this year. The New Yorker published the majority of Cheever’s stories: 121 appeared there between 1935 and 1981. This one was published in the Jan. 24, 1948 issue. It’s the fourth in the Collected Stories, first published in the US in 1978; I’m using the Vintage paperback edition published in the UK in 2010. Michael contrasts the relatively healthy nature of the marriage of Evarts and Alice Malloy as portrayed in this story with that of the Hollises in ‘The Summer Farmer’, his (and my) previous Cheever topic; I’d also contrast it with the rancorous relationship of the Westcotts in the story I wrote about last time, ‘The Enormous Radio’. Cheever, whose struggles with alcoholism and his sexuality are well known, was a connoisseur of fakery. His stories often explore and expose the surfaces his characters assemble to present to the world, and the contrasting, occluded reality underneath. This duality or complexity is apparent in ‘O City’, as it is in many others: there is no single ‘true’ reading. The Malloys’ marriage, it seems to me, is what this story presents, through the fable of the pursuit of the American dream in New York. But despite its apparent wholesomeness, there are fissures in this marriage. Yet Alice is not very bright, as her ‘rind/Rhine’ malaproprism indicates. She fancifully considered the ‘frosty glitter’ of the paving in the station as they arrived at Grand Central station, and wondered naively if ‘diamonds had been ground into the concrete.’ She’s maybe more of a dreamer than Evarts. By bringing his family on the long journey away from their dull mid-Western town to the big city, Evarts Malloy has rashly exposed them not only to its surface glamour and potential for the luxurious life, but also to its dangers and capacity to chew up innocents like them. 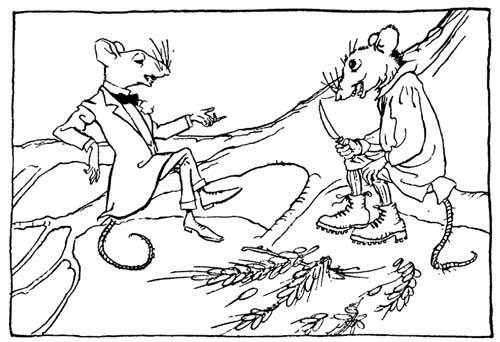 stories co-existing in the narrative: one – the more obvious — is the Country Mouse and the Town Mouse fable: the ‘very green young man’ who has burnt his bridges, ‘takes on Manhattan and almost survives a string of adventures’, and who shows every sign, after being deceived by the people he meets, who all try to exploit his naiveté, from the hotel bellboy to the agents and producers, of dusting himself off and maybe even heading for Hollywood and fame. I think this is a more satisfying reading: it’s true that there’s a hint at a possibly upbeat ending: on the train as it leaves New York Evarts tells his wife he’ll wait till they reach Chicago before deciding whether to take the line home, to return to their ‘dismal town’, and the safe but dull, artistically numb life there, or to head for Hollywood and chase his dream. Michael is clearly rooting for Evarts to become the hick who hits the big time; the narrator hints at this as being the option that’s ‘easier to imagine.’ I’m not so sure: Evarts has only written the first act of his play, and fails to write a word while in Manhattan; he yearns for the smells and sounds of Indiana to inspire him: in New York he’s blocked – though admittedly he’s in a state of turmoil because of what’s happening to them; he and Alice are full of awe at the novelty and modernity of the city. Is he really capable of writing more? Is he even any good? Would Hollywood care? Michael also shows that the narrator, who is usually consistently omniscient and largely shows an ironically knowing tone in portraying the ways in which this innocent couple is repeatedly cheated, perplexed and exploited by the decadent, rapacious inhabitants of the metropolis (‘many innocents had been there before them’, the narrator tells us early on; there’s Cheever’s characteristically pointed use of pathetic fallacy to set the tone: ‘they could see the pitiless winter afterglow beyond the Hudson River’). But the narrator noticeably relinquishes all knowledge and prescience in the final paragraphs, and prefers to use the low modality of the auxiliary verbs ‘may have’. This is a technique he uses in other stories, in order to give the ending the enigmatic quality that leaves interpretation open. I’ve discussed this in previous posts on Cheever. In ‘O City’ he similarly refrains from providing an authoritative, conclusive ending. As Henry James might have agreed, in life, in relationships, there are no endings: all the artist can do is ‘draw the circle in which they appear to do so’. To conclude, I find this story too long. It has all the virtues of the typically well crafted New Yorker story, but also some of the formulaic qualities of the O. Henry sort of plot (as I’ve suggested in previous posts about Cheever stories). You can see the workings. There are too many sequences with rascally conmen keen to exploit Evarts. It’s clear to see, as Michael insists, that it’s a kind of ‘fable’ or ‘parable’. I take him to mean by this that a moral lesson is adumbrated. Because of the story’s ambiguities and its open ending, however, this lesson is clouded. It was a rainy night, and the dark, wet paving, deep in the station, did not glitter, but it was still Alice’s belief that diamonds had been ground into it, and that was the way she would tell the story. Evarts, however, has possibly changed as a result of his abrasive contact with urban slickers, and may well have developed the capacity to adapt and reinvent himself. Does this suggest, however, that achieving the promise of the American dream involves becoming tainted in the process? Evarts seems to have lost his innocence by the story’s end. 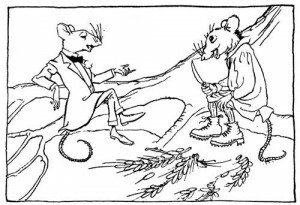 When Alice performs her melodramatic swoon at the end of her party piece song in the over-long middle of the story, the sophisticates at the party cruelly laugh at her. She’s mortified, and Evarts comforts her – but she’s shown him up, too, and embarrassed them both. This epiphany reveals to him the perception he’d previously been unaware of: Alice is a liability. If he’s to hit the big time her small-town limitations and unsophisticated ingenuousness will possibly hold him back. This Zen-like message, with its binary opposites, is: be content with what you have, seek inside yourself for the answer to your prayers (and dreams), don’t quest needlessly far afield for it . Cheever gives this reassuring but constraining, ‘be content with the limited life you lead/home is where the heart is’ message a cynical spin: that mysterious, deliberately open ending refuses to conform to the fabulist’s black-and-white morality tale strictures. Maybe Evarts has learnt a different lesson: to succeed it’s necessary to emulate the sharks. Chris Power’s illuminating survey in the Guardian newspaper of The Short Story includes Cheever at no. 45 here.